Hello SanFrancisco - Epic Day on The Bay! Create your own extreme yacht party with Flyboarding, Zorbing and more! Epic Day on The Bay! Create your own extreme yacht party with Flyboarding, Zorbing and more! Have you ever wondered what it would be like to fly like a super hero? Well now, you can! 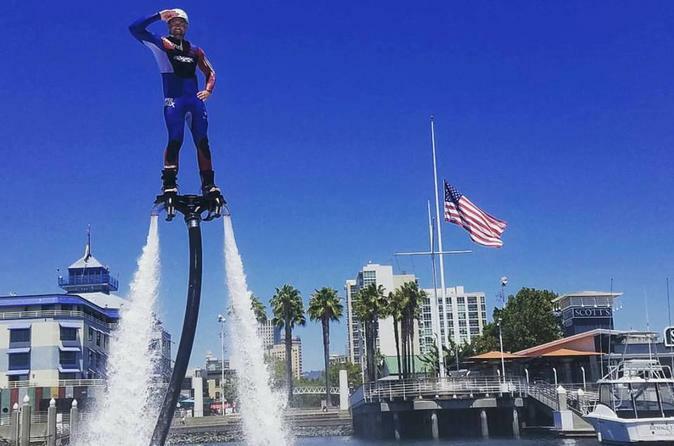 Even though it looks extreme, Flyboarding is actually easy to learn and promises a lot of fun right away. Under expert supervision and in one of the most beautiful places on the planet, our guides will have you up and flying at least once on your first session. By far our most popular package, you get your flyboard experience along with all our other water toys; guaranteed to make your day EPIC! A BBQ lunch and two bottles of wine will be included, vegetarian requests can be made. You're welcome to bring additional wine and beer aboard. Enjoy a full day (5-6 hours) on the water! We'll pick you up on Pier 1 1/2 (please arrange via phone exactly where in the Marina). After a brief intro and everyone is settled, we'll set sail and take you to our hidden warm spots by Angel or Treasure island. Once there, we'll pull out all of our water toys and instruct you on how best to use them. Our certified safety specialists will be there guide you the whole time. We have zorb balls (human hamster balls), flyboarding (think iron man on water), stand up paddle boards and giant floaties. You decide how you want to play! We'll provide a BBQ lunch on board with additional light refreshment. You're welcome to bring wine or beer aboard. After a full day of activity, we'll sail back into port with new friends and a whole day of memories and laughs.